Musicians, doctors, soldiers and painters who, in common, became homeless, have turned to a rehabilitation centre, the Wanderer, in southern Kazakhstan to heal the wounds to their bodies, minds and souls. When the centre was first established in Buguluk gorge, people in nearby villages were not very happy since the homeless have special living habits which made them social outcasts, including alcohol abuse and occasional violence. However, a new community leader, Danila Gusaev, who has served a prison sentence and came to the centre four years ago after finding faith in God, has changed life for the better at the Wanderer. Today, alcohol and tobacco are strictly prohibited. Forty men currently living in the centre work on the group’s garden, raise cattle, and make textile and wood products. One of the Wanderer residents, who used to be a doctor, conducts regular medical inspections and raises funds to purchase medicine for the many residents who have disabilities or serious illnesses. 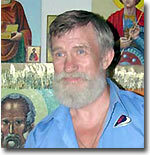 However, the most famous member is painter Viktor Vasilyevitch Bornakov, whose stunning icons are sent to Orthodox churches in the South Kazakhstan region. Two years ago, the Wanderer also purchased a house, with the help of sponsors, to be used as a women’s rehabilitation centre. Ninety percent of the men living in the Wanderer had been earlier forced into working as virtual slaves, Danila Gusev told Ferghana.ru. 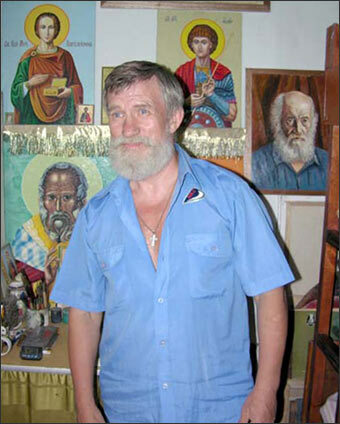 “Some of them were in slavery many times, but managed to escape,” Gusev says. 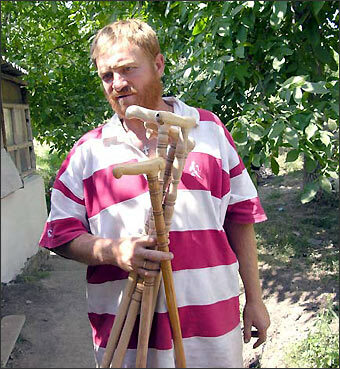 Nikolay Dinakhmetov, a resident, was kidnapped and sold to work as a beggar. “The 'geography' of my work was quite extensive. They took me to Turkestan, Kyzylorda and Aktubinsk. I was taken to a spot early in the morning and had to beg on the streets under the careful view of my 'employers'. At the end of the day they took all the money,” said Danikhmetov. Many Wanderer residents lost their health while in slavery or during attempts to escape their tormentors. Right now, all of them are receiving medical and psychological treatment, although the centre is short of both medicine and doctors.